Part No: WP150003 Category: Pressure Regulators for Millipore®. Tags: 0.45um, 100/PK, 47 mm filter holder, 47mm, alternative, fittings, gauge, graduated cylinder 500 mL, lab water filtration, millipore, pressure regulator, RASDI0001, rephile, sdi, sdi membrane discs, silt density index kit, stopwatch for sdi testing, tubing, valving, water purification systems, ZLFI00001. 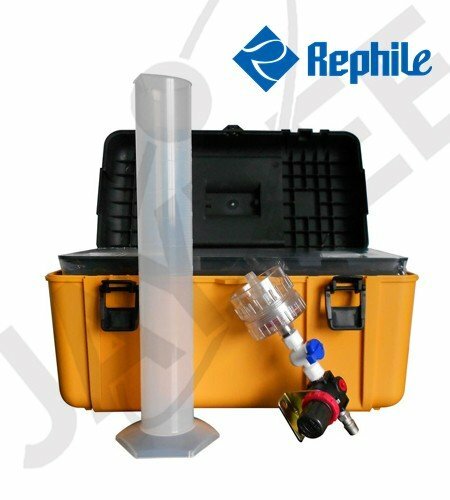 This RephiLe SDI Kit is used to indicate the quantity of particulate contamination in relatively low-turbidity water supplies or waste streams. Designed for lab water purification systems. To check if feed water is within feed water specifications of the purification system. To size extra pretreatment, if water outside specs.